5 sails, manual for engine, sleeps 6, 2 winches, state registered, 5 sailbags, new teak hatch door, new cushions for all berths, main canvas cover, sink, weather vane, Hobie 33 1985 named Vixen – fixed keel-non retractable. There is a 10hp 2002 Honda motor with very little time. There are four sails plus a spinnaker with all bags. The #1 is in fair condition, #2-4 is in good condition and the spinnaker is excellent. This boat has only had two owners. The original owner was a physician who became ill and had to sell. She was in several races when he had the boat. We bought the boat in 1994. She has not been raced since we had her. This boat has been routinely maintained and she has had the bottom scraped and repainted four times. We have lightened up the inside and had her repainted. The lines and sheets have all been replaced. We have rebuilt the hatch cover, however the outside is now needing resanding and varnishing after hurricane Ike. In addition there are some superficial scratches on the hull on both sides plus the railing is bent. These are all the results from hurricane Ike but through it all the boat never took on water. We have always enjoyed her and others have always admired her and everyone wants to race her. 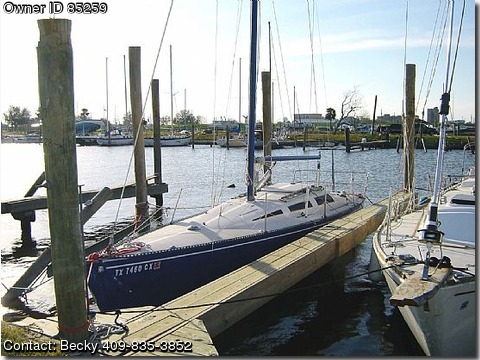 We are selling her due to a chronic illness and would love to sell her to someone who will love to sail her as much as we have.